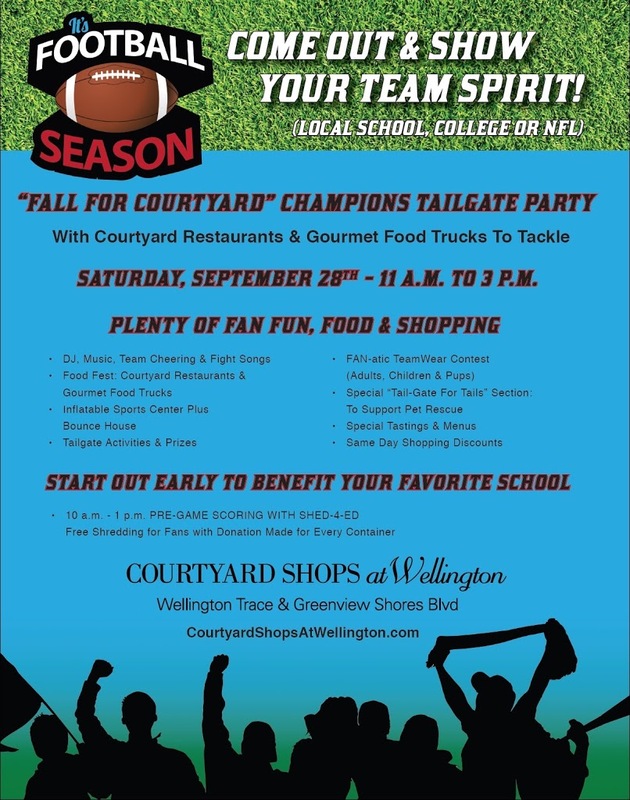 Wellington, FL (September 13, 2013) – Courtyard Shops at Wellington invites area football fans of all ages to “get their game on” and celebrate the kick-off of high school, college and the NFL football season at the “Fall For Courtyard” Champions Tailgate Party, a free, special tailgate event on Saturday, September 28th from 11 a.m. to 3 p.m. Tailgate-goers are encouraged to show off their team spirit to win prizes for the most FAN-atic attire, as Courtyard Shops’ merchants dress in their favorite team fashions and host fun activities. The program schedule is jam-packed with family-friendly activities, including tailgate games; an inflatable 5-in-1 sports center and bounce house; a DJ playing music and spirited fight songs; a FAN-atic teamwear contest for adults, children and pups; a “find the football” scavenger hunt, and more. In addition, Courtyard Shops at Wellington merchants will be offering sidewalk specials, shopping discounts, demos and tastings, coupons, offers and promotional items from participating stores and restaurants. 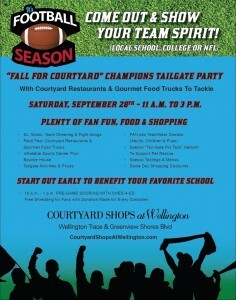 Courtyard Shops restaurants and a fleet of food trucks from Gourmet Truck Expo will serve up a “food fest” for visitors to tackle, serving delicious tailgate grub curbside and delivering an authentic tailgate atmosphere. A special “Tail-gate For Tails” area will promote pet rescue and showcasing pets available for adoption through the Tri County Humane Society. In addition to prizes and treats for the pets donning the best “team spirited” attire, there will be “cool-down” watering and “dog pool” stations to keep your pet comfortable and refreshed. From 10 a.m. to 1 p.m, Courtyard Shops at Wellington will be continuing its free “Shred-4-Ed” program that invites area residents and businesses to “turn their trash into cash” to generate much-needed funds to support area schools. Event-goers can use the free shredding session to safely dispose of personal documents, credit card offers, receipts, check stubs, any other material with sensitive data, granting both security “peace of mind” and getting rid of unwanted clutter; a donation to their favorite school will be made by Courtyard Shops at Wellington for each container they bring to shred. Conveniently located at 13860 Wellington Trace in Wellington at the corner of Wellington Trace and Greenview Shores Blvd, the Courtyard Shops at Wellington is a retail destination with more than 30 shops and restaurants including Publix, Kontiki, Van Dell Jewelers, Eyes of Wellington, Lindburgers Restaurant, Tijuana Flats, and Sam Jon’s Salon. For more information on this or other “Fall for Courtyard” events, visit courtyardshopsatwellington.com, become a fan at facebook.com/courtyardshopswellington, or call (561) 347-6521.